Have you ever considered using a kitchen compost container for your kitchen scraps? Composting kitchen scraps is a great way to cut down on your weekly trash. It also provides you with some excellent organic material for your house plants or for your outdoor gardens. Some people shy away from using a compost container in the kitchen. They think it will be smelly and dirty and the process sounds like a messy hassle. Really, it isn't at all if you do it right. Using a kitchen container for compost is very easy and becomes second nature after a very short time. Odor is easily eliminated by simply emptying your container into the compost pile each day and washing it with biodegradable soapy water. Using a container with a tight fitting lid will also prevent odor and keep fruit flies at a minimum. You can easily use any container you have to collect kitchen scraps for composting. An empty butter or ice cream tub with a lid works perfectly. If you want something a little more decorative for your kitchen counter, there are several options. Compost crocks are pottery containers that have lids and are meant to hold your compost in an attractive way until you can get it outside to the compost pile. Some have filters in them to eliminate possible odors. While the crocks are generally more attractive than other containers, they are also heavier. Plastic compost containers are usually inexpensive and lightweight. This makes them easier to handle when it is time to take the compost to the compost pile. These come in a variety of sizes and colors. 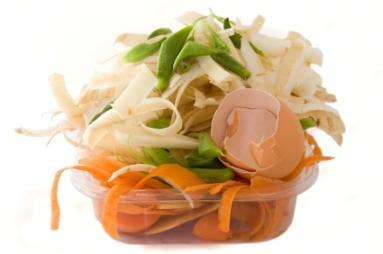 One of the common problems in using plastic is that it can absorb and retain odors. Stainless steel containers do not absorb odors and are easier to keep clean that plastic ones, plus, they are lighter weight than pottery containers. They are often made to fit underneath the sink so that they are convenient when you are cleaning the kitchen. Some have filters to keep odors out of the kitchen as well. When the composter is full, all you do is take it out to the compost pile. Electric composters use only 5 kWh (kilowatt hours) per month to create compost right in your kitchen. They can accommodate up to five pounds of food scraps a day and in two weeks you have fresh compost for your plants. These are great for townhouses and apartments where you may not have a yard at all. They are quite expensive, so be prepared to pay $300 to $400 for one. Microbial composters create hot compost without electricity. You add microbes to the food scraps and the microbes breakdown the scraps and turn it into compost. This process takes about two weeks. Like the electric composter it is designed to work right in your kitchen. Once you start composting your kitchen scraps you will see how easy it is to reduce waste and add organic compost to your plants for free. Composting in the kitchen reduces the amount of waste you and your family contribute your local landfill.